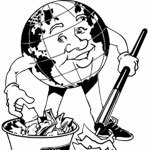 It’s time again to roll up those sleeves to tackle trash and beautify Burien during the city’s annual Clean Sweep, starting at 8 a.m. on Saturday, April 27th, and sponsored by PCC Community Markets and Recology CleanScapes. From 8 a.m. – 12 noon, Volunteers will be picking up litter, eliminating graffiti, and sweeping sidewalks in the Burien Community. Includes 125 Gloves with your logo / name on them. On-Site exposure and Banner placement on site. The knowledge that all the volunteers will be wearing safety vests! On-Site exposure passing out raffle prizes. Logo on Poster and ability to serve breakfast. Logo on Poster and ability to serve lunch.